Nevron Chart for SharePoint is an advanced chart web part, which delivers a complete set of 2D and 3D charting types, highly customizable axes, advanced data analysis features, tight data integration and visual effects to your SharePoint sites. It combines the Nevron Charting engine for ASP.NET together with the elegant Nevron Pivot Data Aggregation engine. This allows Nevron Chart for SharePoint users to create complex pivot charts visually and directly in the SharePoint environment. Support for SharePoint Server 2007 - Nevron Chart for SharePoint introduces a new level of data visualization, designed to enhance your digital dashboards and reports in SharePoint enviroment. Support for Multiple Charting Areas - Nevron Chart for SharePoint has support for unlimited number of charting areas. Each charting area has its own charting type and can be rendered in 2D or 3D mode. Charting areas can be automatically or manually arranged. Support for Multiple Legends - Nevron Chart for SharePoint has support for unlimited number of legends. Each values data grouping can be assigned to a different legend. Legends can be manually positioned or docked to chart, chart areas and plot areas. Support for Multiple Titles - Nevron Chart for SharePoint has support for unlimited number of titles. Titles can be manually positioned or docked to chart, chart areas and plot areas. Support for Binding to Diverse Data Sources - Nevron Chart for SharePoint can bind to any ODBC, OLEDB or SQLServer data source and to the SharePoint specific Business Data Catalog. Pivot Data Aggregation - Nevron Chart for SharePoint supports advanced pivot data aggregation features. You can use formula expressions to group, filter and sort the data. Data groupings are created for chart categories, series and values via client-side drag and drop. Numerous functions for different mathematical, statistical, date-time, logical and text operations ensure that the pivot aggregation is flexible enough to meet even the most complex data analysis scenarios. Fast Web Based Chart Designer - Nevron Chart for SharePoint features an advanced chart designer, which is built with jQuery UI. The chart designer is fully ajaxified and supports all major web browsers. It does not use postbacks, MS ASP.NET controls or MS AJAX, which ensures that the server-client communication is brought to a minimum, the client-side is pure HTML/CSS with jQuery and the server-side UI processing is pure HTML and script rendering. Bubble Charts - available in 2D and 3D - Bubble Charts display multi dimensional data as points in a Cartesian coordinate system. The size of each point is determined by an additional size value. The actual size of the bubble is interpolated to be in the MinSize - MaxSize range. Float Bar Charts - available in 2D and 3D - A Floating Bar Chart displays a sequence of vertical bars, each bar representing a one-dimensional value range. A Floating Bar chart can be used as a Gantt chart if the Y axis is in date-time scale mode. Gantt charts are popular in project management for planning the use of resources over time. High Low Charts - available in 2D and 3D - A High-Low Chart displays a sequence of data points, each representing a one-dimensional value range. The begin values of consecutive data points are connected with a "low" line. The end values are connected with a "high" line. The area between these two lines is filled with different colors, depending on whether the "high" line runs above or below the "low" line. Stock Charts - available in 2D and 3D - Stock charts are used to plot stock data, usually over time. Stock charts use color coding to distinguish between stock prices, which went up or down when the stock closed. Funnel Charts - available in 2D and 3D - The Funnel Chart is similar to a Stacked Percent Bar Chart with only one category. It represents 100% of the summary values for the data items included in the chart. Funnel Charts are often used to represent stages in a sales process and show the amount of potential revenue for each stage. This type of chart can also be useful in identifying potential problem areas in an organization's sales processes. Nevron Funnel Chart provides control over labeling, neck width and height and points gap. Radar Charts - available only in 2D - A Radar Chart plots the values of each category along a separate axis that radiates from the center of the chart and ends on the outer ring. A line connects all the values from the same series and optionally the area enclosed by the line can be filled. Polar Charts - available only in 2D - Polar Charts display 2-dimensional data points in a polar coordinate system. The position of a point is specified by its distance from the center and a rotation angle. The points are connected by a line and optionally the area enclosed by the line can be filled. Surface Charts - available only in 3D - Surface Charts display a surface connecting the adjacent data points. Multiple series are not supported by surface charts. That is why only one series is created which takes the properties of the first values data grouping displayed in the Surface Chart chart area. Additional series append values to this series (in the case of a Mesh Surface) or add depth to the surface grid (in the case of Grid Surface). Combo Charts - available in 2D and 3D - Combo Charts are used to combine certain series types within the same chart area. Series types are specified per values data groupings. There are many per series type options. You can combine the following series types: Bar, Area, Smooth Area, Line, Smooth Line, Step Line, Point, Bubble, High Low and Stock. Nevron Chart for SharePoint Chart Axes Features - Complete set of axis-related features designed to target even the most compelling charting requirements. The axes are largely automatic, allowing you to focus on your project, but if needed you can customize every aspect of their appearance and behavior. Primary and Secondary X and Y Axes - Nevron Chart for SharePoint supports Primary and Secondary X and Y Axes. You can specify the X and Y axes on which each values data grouping (chart series) is scaled. Advanced settings allow you to make use of axis crossings, docking and percent positioning. Depth Axis - In 3D charting, the axis model is extended with an additional depth (Z) axis. The Z axis allows data to be plotted along the depth of the chart. It automatically scales in Numeric or Categorical scale mode, allowing the creation of XYZ scatters and XZ-plane categorical plots. Special Radar and Polar Axes - Special Radar and Polar axes are exposed for Radar and Polar charting types. These aim to provide advanced settings for complex requirements related to these charting types. Angular scale - displays angular data in degrees, radians or grads (used in polar charts). DateTime scale - suitable for display of date-time data. ValueTimeline scale - advanced date-time scale, widely used in financial charts. RangeTimeline scale - advanced date-time scale, widely used in financial and project management charts. Categorical Scale - The Categorical Scale is automatically selected, depending on the respective chart dimension type. It has the following advanced features: supports unlimited grouping levels, grouped and single-row labels, mutliple presets for groupings appearance and layout. Advanced Axis Positioning Options - Axes can be docked to the chart sides (or polar rim) or crossed with another axis (at value or percent). In addition, axes can share a single chart edge. Axis Title - Full control over the appearance, position and angle of the axis titles. The axis titles text supports advanced rich-text formatting. Ruler - Control over the begin and end ruler caps appearance and shape. Option to highlight scale breaks on the ruler. Axis Range - Nevron Chart for SharePoint provides control over the axis range. Ability to inflate that range in several modes. Gridlines - Nevron Chart for SharePoint supports major and minor gridlines, with full appearance customization and control over the walls on which they are displayed. Ticks - Support for major and minor ticks with control over their appearance and position. Axis Stripes - Axis Stripes highlight repeating ranges of data on the chart walls, with a controllable show/hide pattern. Axis Sections - Axis Sections conditionally modify the appearance of axis ticks, gridlines and labels, provided they are within a user-specified data range(s). This feature helps you to highlight important ranges of data along the axis. Const Lines - Const Lines show constant lines (reference lines) at user-specified value(s). In 3D mode they are displayed as planes perpendicular to their owner axis. Breaks - Axis Scale Breaks skip a range of values on the axis. They are used to increase the readability of the chart, in cases when the data is clustered in distant data ranges (for example: half the data points are around 100 and the other half are around 1,000,000). Without scale breaks, such data cannot be visually compared. 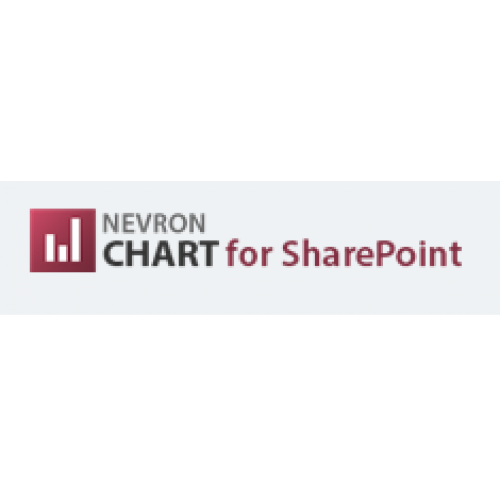 Nevron Chart for SharePoint provides support for manual and automatic scale breaks with full control over appearance and behavior. X and Y scale breaks can be crossed. Scale breaks are also displayed in 3D Mode (unique feature). Label Layout - Nevron Chart for SharePoint provides advanced axis-label layout options, which let you resolve very complex axis-label overlapping cases. Label Formatting - Label Formatting controls the formatting of values along numeric scales. Many advanced options for currency, percentage, scientific and date time label formatting are available. Nevron Chart for SharePoint uses the Nevron Pivot Data Aggregation Engine. A simplified pivot charting model was first introduced in MS Excel - if you are using this feature of MS Excel then you already know the basics of pivot charting and its power. In MS Excel, data groupings are simply created for field values and a predefined set of aggregate functions are available for calculating the series data point values. Because the Nevron Pivot Data Aggregation Engine is data source invariant, this allows you to create pivot charts from any data source, which can provide a table representation of its data. Because Nevron Chart for SharePoint and Nevron Chart for Reporting Services are built on top of the Nevron Pivot Component framework, they are generally having the same functionality and features. This helps you streamline your IT reporting efforts and reduce your IT staff learning curve - be it SharePoint or Reporting Services - you know that Nevron provides the same powerful and consistent pivot charting functionality. Speed - Nevron Chart for SharePoint is a fast rendering chart inside SharePoint - in both 2D and 3D modes. 2D Charting - Nevron Chart for SharePoint is a chart for SharePoint environment to provide Adobe Photoshop like image filter effects, which are applicable to all chart elements - these include bevel, emboss, lighting filters etc. When it comes to shadows it is the only chart for Share Point, which has soft shadows (based on Gaussian and Radial blur image filters). 2D/3D Consistency - Nevron Chart for SharePoint is consistent in 2D/3D modes. For example you can map gradients to elements in both 2D and 3D. Colors specified in 2D are inherited by materials in 3D. You can mix 2D and 3D chart areas in a single chart control. XY and XYZ scatters - Nevron Chart for SharePoint includes support for XY and XYZ scatters inside SharePoint.